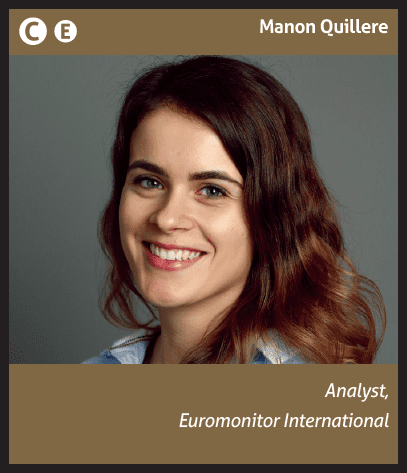 With nearly 11kg per capita retail tissue consumption in 2017, Germany is the third most saturated market in Western Europe, just behind Ireland and Austria. 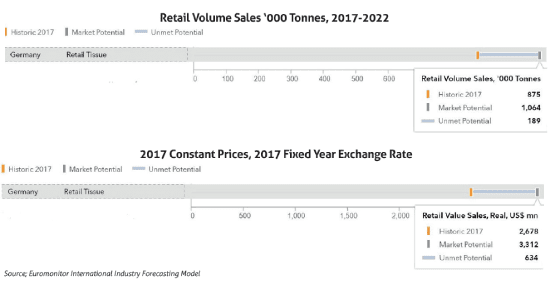 Subsequently, the demand for tissue and organic growth have been slow, with retail sales expected to register a volume CAGR of just 0.7% between 2017 and 2022. 189,000 tonnes in volume, compared to total retail consumer tissue volume sales of 875,000 tonnes and USD2.7 billion in value terms in 2017. The high per capita consumption suggests that use patterns are already well established on the market. Consequently, demand is set to be largely driven by fundamentals like population growth and GDP growth in the coming years. Since annual population growth in Germany remains below 1% – and is expected to slow down even further in the next five years – there is little scope for the population to boost demand for retail tissue in the country. Improved GDP projections though, might help consumers feel more confident and spend more on value-added products. 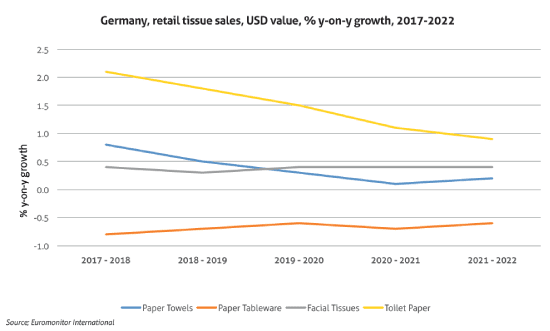 In addition to structural challenges, another factor is putting considerable pressure on value sales growth of retail tissue in Germany, namely, a strong presence of private label. Price elasticity being very high in retail tissue, most consumers do not show a high degree of brand loyalty and tend to look for products with the best prices and discount offers. Subsequently, Germany has the highest share of private label retail tissue in Western Europe, which stood at 73% in 2012 and further increased to reach nearly 75% in 2017 in value terms. Broadly speaking, the competitive landscape for retail tissue in Germany shows a high level of concentration in the hands of three key retailers marketing strong private label portfolios, namely Aldi, Lidl, and Edeka Zentrale. Private label tissue products sold by these three leaders together accounted for 47% of consumer tissue value sales in 2017. Even though private label lines continue to highlight low prices, these days they also do not significantly vary from renowned brands in terms of quality and efficiency in handling household tasks. Leading drugstore chains such as dmDrogerie Markt or Rossmann for example increasingly offer sophisticated and innovative tissue products with value-added features, including also a variety of designs and scents. Socio-economic changes can benefit the performance of retail tissue in Germany. Indeed, GDP per capita amounted to USD43,594 in 2017 and is set to grow at an average annual rate of 2% over the forecast period, to reach USD48,104 in 2022.
are likely to create further potential and can entice German consumers into purchasing more value-added products instead or in addition to mere essentials. industry leaders like Essity, which can help to add to the tissue industry’s revenues. product categories hold more potential than others in value terms. This is the case of toilet paper, for instance, which registered 4% value growth in 2017 and is set to record a 1% CAGR in value terms over the forecast period. This growth is expected to be driven by higher quality value-added tissue products. Some German consumers, especially those who are less price sensitive, appreciate products that they see as offering higher levels of softness and cleanness, usually with 3-ply paper as the minimum, but 4-ply and even 5-ply products. Additional features such as a subtle scent or appealing print often add enough value to convince some consumers to opt for slightly more expensive products. Value growth opportunities within moist toilet wipes? With limited growth opportunities in retail tissue, tissue and hygiene manufacturers have been making significant efforts to encourage consumers to use a wider range of products. They notably launched numerous advertising campaigns to raise further awareness around moist toilet wipes. Additionally, they increased the selection of products available in this category across price ranges, including private label. Subsequently, growing numbers of consumers use moist toilet wipes in addition to dry toilet paper. Retail sales of moist toilet wipes in Germany recorded a 4% value CAGR over 2012-2017, and the growth is expected to continue at a healthy rate in the coming years. Share the post "Consumer tissue in Germany: maturity, private label pressures, and value-added innovation"